Ethiopia Days 1 and 2.
we all came away with a desire to go yet deeper with our Jesus. In the evening we had our first team debrief which was amazing. unique dynamic we have is truly amazing. God is so so good. 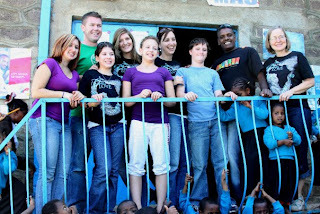 visit to Peters project with CFI. I love this ministry so much. deep love the kids have for him and his love for them is so obvious. looked at him she threw her arms around his neck as he scooped her up. An amazing picture of being a father to the fatherless. I melted. time. It was a photographed moment, they all loved it! are all amazing and watching them with these sweet kids is incredible. Undeserving yet grateful child of the King, married to my best friend David, together we are raising our four kids. We started the adoption process for the second time in March 2010. On December 7th we found our daughter on our agencies waiting child list. We are now working to raise the remaining funds to travel to Ethiopia and get her. Our family is forever changed by adoption. Advocating for orphans, passionate about Ethiopia, seeking out what God has for us next.